The M.E. Griswold Co. was formed in the mid 1890s to produced bicycles made from stamped sheet metal, a technology pioneered in 1890 by another Chicago bicycle manufacturer, the Western Wheel Works. Up until that time, bicycles had been made entirely of forged steel parts and tubing. Griswold’s parts were punched from a flat sheet of steel, rolled or pressed into shape by large hydraulic presses, and then brazed or electrically welded along their joints. While pressed parts were not always as strong as drop-forged components, they were strong enough for use in bicycles and as they didn’t require as much machining and finishing, they were much cheaper to produce. Griswold didn’t market bicycles using their own name, electing to use the Independence and Prairie King brand names instead. Unfortunately, Griswold had entered the bicycle business at the tail end of the cycle craze and by the early 1900s few profits were realized by a firm producing two-wheelers. Western Wheel Works were now manufacturing stamped sheet-metal automobile parts and Griswold’s presses were soon stamping out automobile parts as well. Unlike Western, Griswold realized that by relocating to Detroit, greater profits could be realized, so in July of 1909 he moved his machinery to the former King Stock Yards Hotel, a 90’ x 110’ wood-framed structure located in the 5800 block of Commonwealth St., which is near the present day downtown Detroit campus of Wayne State University. The firm was organized as the Griswold Body Company with H. F. Marsh. President; M.E. Griswold, vice-president; A.F. Marsh, treasurer; Louis Smith, secretary and general manager; and Elmer Day, superintendent. A new 42’ by 85’ addition was built in January of 1910, but a large fire destroyed the plant on January, 14, 1911. A larger all-brick facility rose from the ashes and Griswold was back in production within six months. Griswold produced production bodies for countless early Detroit builders such as Columbia Motors (producers of the Columbia Six) from 1920-1924; King, 1922-1923; Palmer 1912-1913; and Partin-Palmer,1913-1917. The firm’s large presses supplied hood and cowl stampings to other small Detroit-based automakers and body builders who couldn’t afford the expensive equipment themselves and by 1915, the additional business allowed Griswold to expand and a new $12,300 3-story brick building was added to the existing Commonwealth St. factory. Griswold built a large number of commercial bodies for local businesses and offered them in knocked-down kits to regional truck dealers who assembled them on-site. 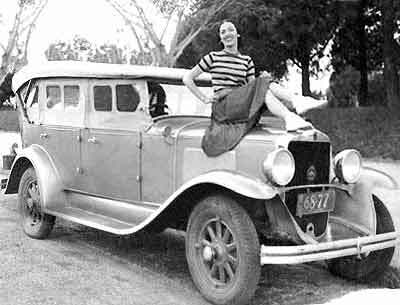 During the Twenties, Griswold built bodies for Chrysler, Columbia Six (1920-24), Jordan, Jewett (1924-25), King (1922-1924), Paige (1924-26) and Willys-Knight (1929-30) and were producing over $500,000 worth of bodies a year. 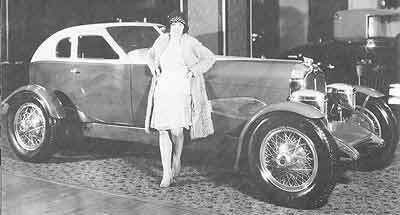 Detroit’s larger production body firms concentrated on closed bodies, which were becoming increasingly popular as the twenties wore on. So in order to survive, smaller firms like Griswold were forced to make styles that were too expensive for the larger firms to produce. So from 1925 on, they concentrated on open bodies, producing a number of phaetons, roadsters and convertibles. Unfortunately, when the Graham Brothers took over Paige-Detroit in mid-1927, they cancelled all existing contracts with outside body suppliers and established the Graham-Paige Body Corp. Graham Paige Body purchased the old Harroun Motor Car Co. factory in Wayne, Michigan for use as a body plant, and a lumber mill in Perry, Florida to supply them with an uninterrupted supply of hardwood. With the opening of their second Evansville, Indiana body plant in November of 1928, Graham-Paige Body Corp. was now able to supply their parent company with 90% of its bodies. The February 16, 1929 issue of Automotive Industries featured an item announcing Griswold’s “new semi-convertible" fabric body. Designed by Robert Grimshaw, Griswold’s chief designer and body engineer, the Zapon-covered body featured side windows that rode in their own stationary channels, a design that was used 20 years later by Nash in their 1950-53 Rambler convertibles. The design significantly reduced the rattling windows and leaky cabins that plagued early convertible owners. The prototype was built on the 6-cylinder Graham-Paige Model 619 119” chassis. A second prototype using a Graham-Paige Model 615 115” chassis was also produced, but no orders were forthcoming from Graham-Paige for either version. However the were given a small contract for 1929 Model 614 two-door convertible sedans and Model 614 and 619 phaetons. Auburn advertised the Cabin Speedster had been designed by the firm’s test driver, a well-known racer named Wade Morton. A number of historians credit Alan Leamy with the design as its tail looks similar to a four-door closed speedster he designed while working at Auburn. However, the Cabin Speedster’s patent features Morton’s name and Leamy's designs appeared after the Speedster was built. The lightweight aluminum body featuring a radically canted windshield, wicker seats, a ducktail deck, and cycle fenders that turned with the wheels. While on a visit to the Griswold at the time, California-based auto designer W.E. Miller saw it while it was under construction. The car was designed as a showpiece and it was the sensation of that winter’s New York Automobile Show. In February 1929, it appeared on the Auburn stand at Los Angeles’ Pacific Southwest Automobile Show. Unfortunately a short circuit in the show’s massive lighting system touched off a fire which destroyed all 300 of the cars on display and the Speedster burned to the ground. In 1983 Dr. Peter C. Kesling, of LaPorte, Indiana, built 2 Cabin Speedster replicas, one a mirror image of the original, the second with a more contemporary T-­top roof. The duplicate of the original was displayed at the 1986 Pebble Beach Concours d'Elegance where it placed second in Class F for European and American classics with new coachwork. The second, T-topped Speedster, is currently on display at the Door Prairie Museum in LaPorte, Indiana. 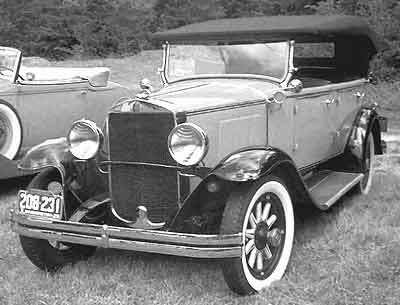 Griswold’s last known series if production bodies were for the Willys-Knight Co. Amos Northup designed all four of the 1929 Model 66B standard bodies. Griswold built the two standard open body styles, the phaeton and the roadster, however they did not build the dual-cowl phaeton, which was considered a custom body and built by LeBaron. Very few of the phaeton’s survive, however there’s quite a few roadsters, most of which are painted in the same “plaid-side” paint scheme featured in the 1929-30 Willys-Knight catalog. The plaid-side roadsters were popular at the time and remain a favorite amongst Willys-Knight collectors today. After the initial run of roadster and phaeton bodies were produced for Willys-Knight, The bodies were redesigned and Gris­wold was dropped as a Willys-Knight supplier in mid-1930. Normally, Griswold’s commercial body business would provide enough revenue to keep the plant open during slow times, however in 1932, the Depression had so severely curtailed their former customer’s business expenditures, that rather than face bankruptcy proceedings, Griswold’s board of directors elected to close down the plant and sell off its assets. The Griswold Body Co. should not be confused with the Griswold Motor Company, another Detroit-based manufacturer who built automobiles during 1907. Two other unrelated firms, made Griswold automobiles as well, the first in Quincy, Massachusetts from 1905-06, the second, in Troy, New York during 1906.